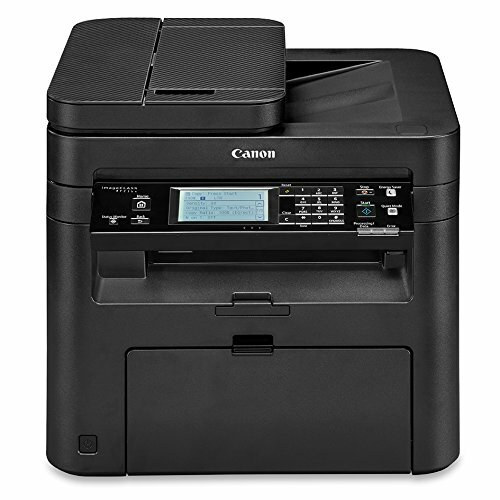 The all-in-one, Canon imageCLASS MF236n laser printer offers high quality output, feature-rich capabilities and reliability that is ideal for any small office or home office environment. The image class mf236n has print, scan, copy and fax capabilities so you can accomplish all necessary tasks with just one machine. With many easy to use features such as the intuitive touch LCD panel and various mobile solutions, your daily workflow will be a breeze. Your professional quality documents are printed at speeds of up to 24 pages per minute in black and white with a quick first print time of 6 seconds or less. The tiltable, 6-Line LCD panel allows you to navigate through the menu seamlessly. The wide screen is user friendly and easy to read, and you can also customize your home screen to access your most commonly used features quickly and easily. The image class mf236n is equipped with a variety of easy to use mobile capabilities for printing on-the-go using your compatible mobile device, such as apple air print, mopria print service and Google cloud print. You can also scan hardcopy originals using the Canon print business app. With ID card copy, you can easily create copies of identification cards or other small documents on a single page, and eco-friendly 2-on-1 and 4-on-1 printing options save paper and related costs. With the front-loading 250-sheet paper cassette, 35-sheet automatic document feeder and 1-sheet multipurpose tray, your paper handling requirements are covered. The image class mf236n uses approximately 1.3 watts of energy in wired, energy Saver mode, helping you save money on energy costs. The single cartridge system combines the toner and drum into 1 unit, making replacement of cartridges simple. This machine uses Canon genuine toner, cartridge 137. Seamlessly navigate through all the features with the user-friendly 6-line, tilt able, black/white touch LCD panel. Print at speeds of up to 24 pages per minute, with your first Print in your hands in 6 seconds or less.